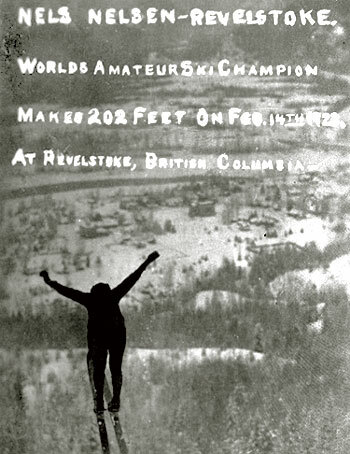 British Columbia's first ski club was created in 1891 at Revelstoke, and in 1898 Revelstoke hosted the first national ski jumping championship. World amateur ski competition, 1928. BC Archives A-08995. Mountains have different meanings for different people. They can be sources of inspiration, barriers, places of fun or somewhere to earn a living. This is a photograph of black coloured, children’s skis, ca 1930, with a zoom in option that allows a close up view of buckles that would attach boots to the skis. This is a black and white photograph of a steam train going through a mountain pass near Field, British Columbia. This is a black and white photograph of a snowplow and crew clearing snow after a snow slide at Rogers Pass, British Columbia. This is a black and white photograph of the view from British Columbia Forest Service’s Graves Lookout, East Kootenay’s in 1959. This is a black and white photograph of two mountain climbers on British Columbia’s Mt. Dalgleish, ca 1930. This is a black and white photograph of two miners loading mine cars at the 115 metre level at Hidden Creek Mine, Anyox, British Columbia.